A PFD must be worn by a child 12 years old or under while aboard a vessel which is underway. All PWC riders and anyone being towed must wear a PFD. Current regulations require all vessels to carry a wearable PFD for each person onboard. A throw able PFD is also required on vessels, excluding those less than 16′. The Office of Boating Safety & Education suggests all vessels carry a throw able with a line attached for casting, and that you wear your life jacket as it is meant to be worn, and at all times. Just as drinking and driving don’t mix, drinking and boating are a dangerous combination. Sun, glare from the water, constant boat motion and boat vibration all contribute to boater fatigue. Add alcohol consumption and those problems are compounded. Additionally, alcohol affects balance and muscle coordination, causes tunnel vision and slows reaction time. It also affects reasoning and increases the tendency to take risks. Operating a boat under the influence of alcohol or drugs is against the law and could result in fines up to $1,000 for first offense and/or up to 60 days in jail. A blood alcohol content of 0.08 or greater constitutes being under the influence. The speed of all vessels on Delaware waters must be slow enough to prevent any wake of appreciable height when the vessels are within 100 feet of: “Slow-No-Wake” speed areas, docks, launching ramps, marked swimming areas, swimmers, anchored, moored, or drifting vessels. Delaware Fish & Wildlife Natural Resources Police are responsible for enforcing all of the safe boating laws in Delaware. To report violations and accidents call their 24 hour dispatch line at: (302) 739-4580. One approved wearable PFD for each person on board plus one throwable PFD. One type B-1, if carrying passengers for hire, or if boat construction will permit entrapment of flammable vapors. will permit entrapment of flammable vapors. if boat construction will permit entrapment of flammable vapors. 7. Atlantic Ocean, Delaware Bay and Delaware River South of Artificial Island—U.S. Coast Guard regulations require all vessels to carry day and night distress signaling devices. Outboard motorboats less than 16‘ in length are exempt from daytime requirements. 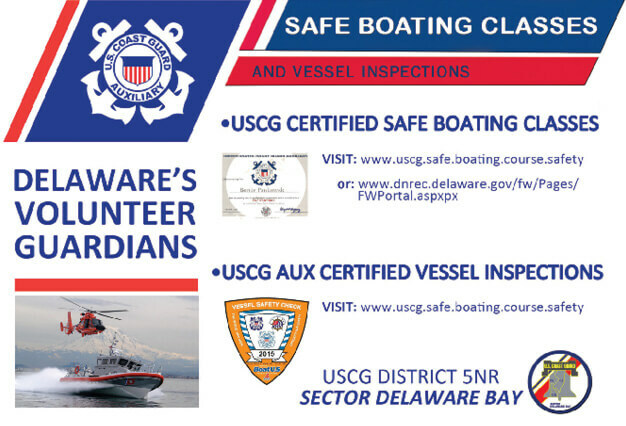 * Test for serviceability of PFD—All PFD’s must be readily accessible, in serviceable condition, legibly marked with approval number of the U.S. Coast Guard and be of appropriate size. PFD’s must have flotation material without rot or being waterlogged, untorn or damaged coverings and straps in good condition.